Star Plus aired its latest episode of The Voice India and once again the most talked about contestant has turned out to be the one whom we are yet to properly meet. Anikait, the guy from Kashmir, who has stolen every heart in India, sang his rendition of Pal Pal Dil Ke Paas. His crispy voice will tug at your heartstrings when you listen to it in the video below. Anikait is on Harshdeep Kaur's team and she looked just as impressed by his performance as we are. The channel uploaded a very small glimpse of Anikair's latest performance on their social media pages and it is already viral. 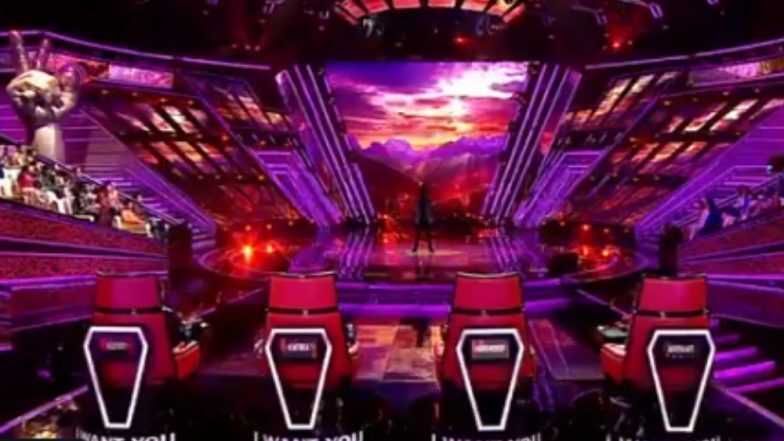 The Voice India 2019: Anikait's Latest Blind Face Performance Dedicated to Indian Soldiers Gets the Judges and Twitterati Emotional - Watch Video! Anikait's performance on Pal Pal Dil Ke Paas from the movie Blackmail, that released in 1973, is surely one of the best reiterations of the song on a reality show. Pal Pal Dil Ke Paas was originally sung by Kishore Kumar. Kalyanji-Anandji were the music composers of the romantic ditty. Even in this episode, Anikait continued to hide his identity from the viewers. The singer gained popularity because he refused to reveal his face on the singing reality show. We still do not know what he looks like. Anikait is worried about his family living in Kashmir, who might get into trouble for he is taking part in an Indian reality show. The Voice season 3 is gaining popularity day by day in India. With that Anikait's popularity is also growing. Last week he performed a tribute for the soldiers who were martyred in the Pulwama attack and moved the audience to tears. The show is currently judged by Adnan Sami, Armaan Malik, Harshdeep Kaur, and Kanika Kapoor.